Now that we have been on the road for about 17 months, we have learned a few things; one of the most important is that we are flexible and can go where we want, when we want. 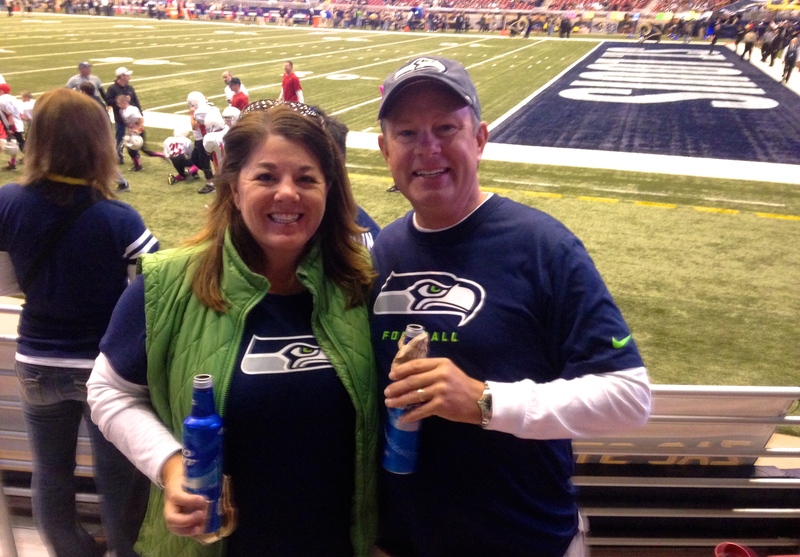 So, as we sat in the rainstorms a few weeks ago, we made the decision to detour our route and head back up to St. Louis for a Seahawks game. On the way, we made a stop in Branson, Missouri. We settled the MoHo at Americas Best Campground, yes that was the official name. The terrain in Branson was very hilly, with steep drops and high rising ridges everywhere. This type of landscape makes it difficult for RV parks to level out the area to make it easy to drive into and then park on a somewhat level site. In our research, we found a park right down on the waterfront, but I was too late in trying to get in there, so we had to take our second choice, much further up on a hill, about 3 miles out of town. Many people have heard of Branson, a mecca for live entertainment. We were both interested in what all the hype was about, so staying here for a few days on the trip back up to St. Louis was a nice break in the drive. For those who have not heard much about Branson or never been there, it was certainly interesting. There are several main roads that traverse across the tops of the ridges, and just about every 300 yards is a live entertainment venue. The places host everything from comedy shows, to variety shows, to music concerts, to impersonators and everything in between. I am not exactly sure, but I would guess there must be some 50-60 places one can go to a show. The shows, many of which are shown twice daily, bring in people from all over the world. 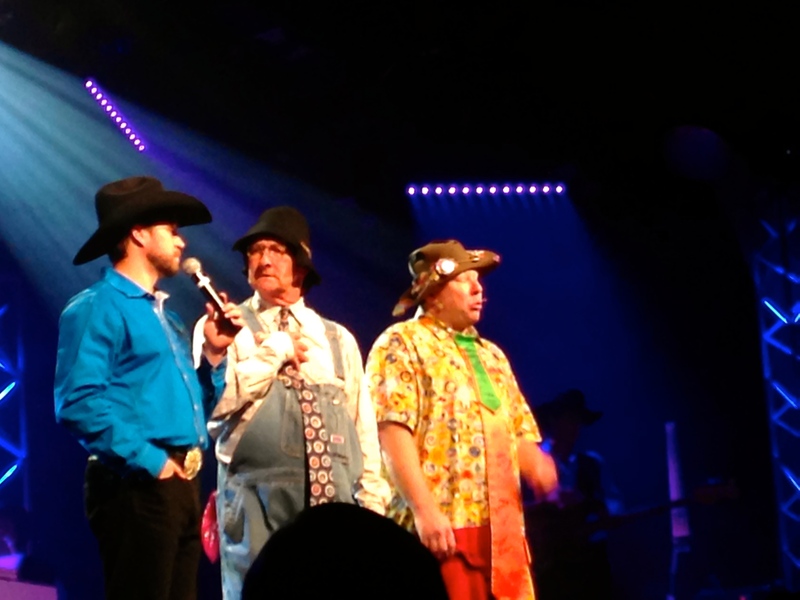 We were given some free tickets from a neighbor in our park, and ended up going to the Baldknobbers, the first and longest running show in town. The show started in about 1959, and it is a variety/music show, put on by many of the family members of the original entertainers. Traci and I are not big show people, so we were glad we had free tickets. 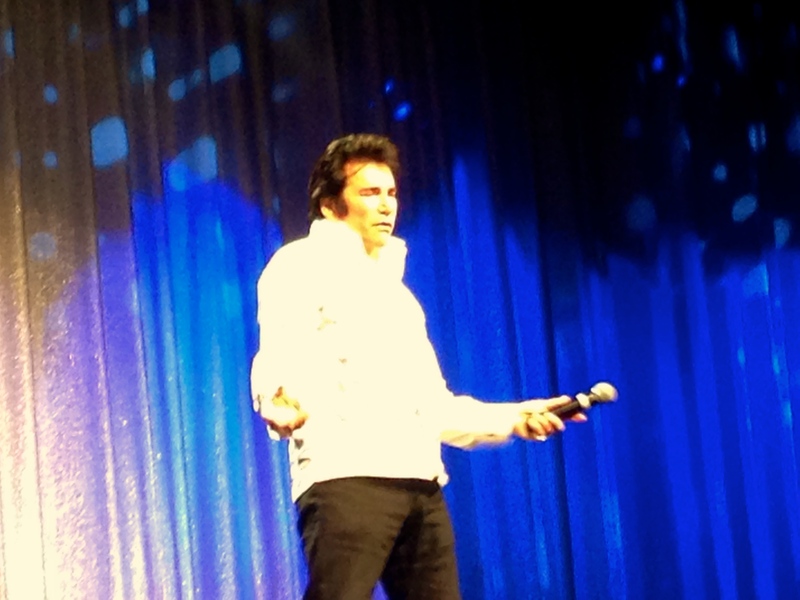 We can officially say we went to a show in Branson. 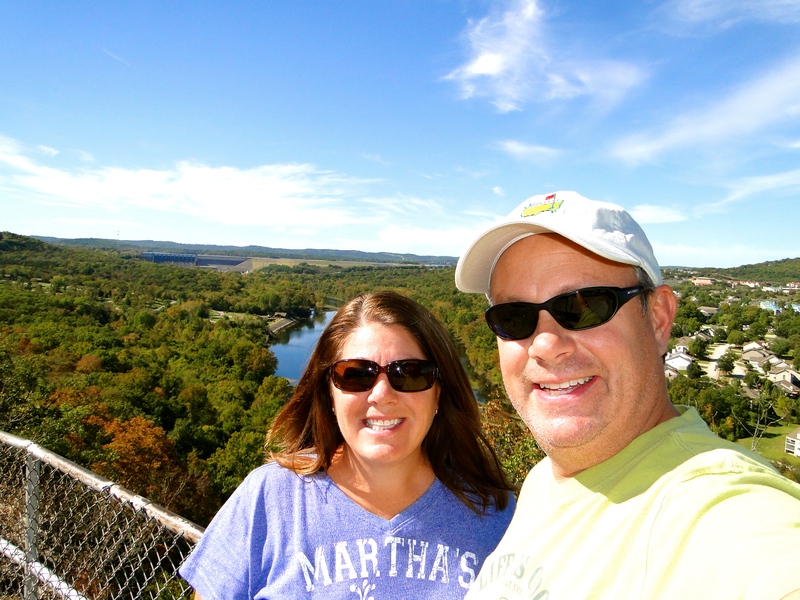 During the rest of our stay in Branson we took advantage of the nicer weather. 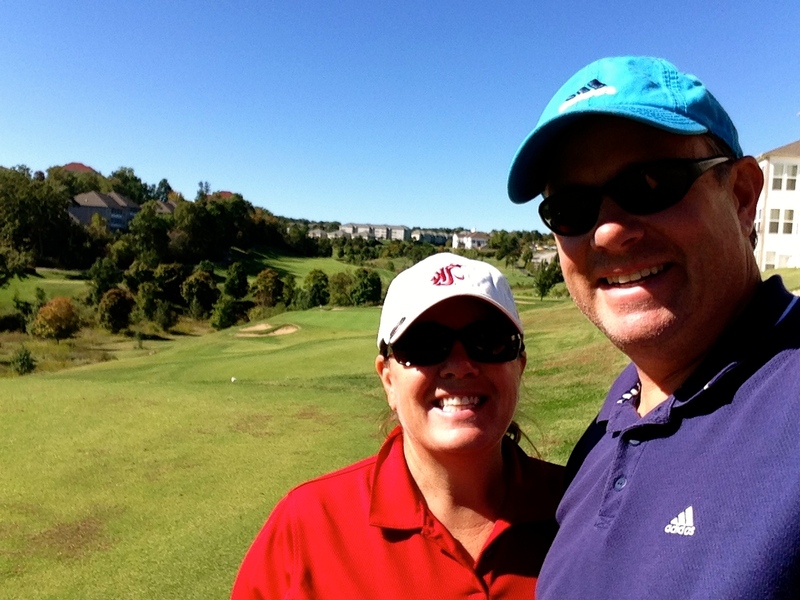 We played golf at a small little par 64 course right in the heart of town, Thousand Hills Golf Resort. A very short course, with 9 par-3’s, but a lot of nice views of the canyons that make up the area. Another day we drove out to the lake and Table Rock State Park. There is a massive dam there, and the lake that is created behind it as seen from the maps is giant. The water was super clear, a surprise because much of the rivers in the area we have seen lately have been brown and murky. We drove around some more and ended up at the Branson Landing. This is a riverfront area with shops and restaurants, much more appealing to us. We stopped in for a late lunch on the deck of one of the eateries, and it was a very relaxing end to our stay here. A beautiful day for golf! Leaving Branson, we headed back to St Louis. For us, this was our first return to a city we have already been to; we stayed here a few days back in late April. We tried to stay at the same park, but it was closed for the season. We ended up at the Cahokia RV Park, on the Illinois side of the river, southeast of downtown. A more rustic type campground, but that was all we needed, as our stay here was strictly business, the Seahawks game vs. the Rams. 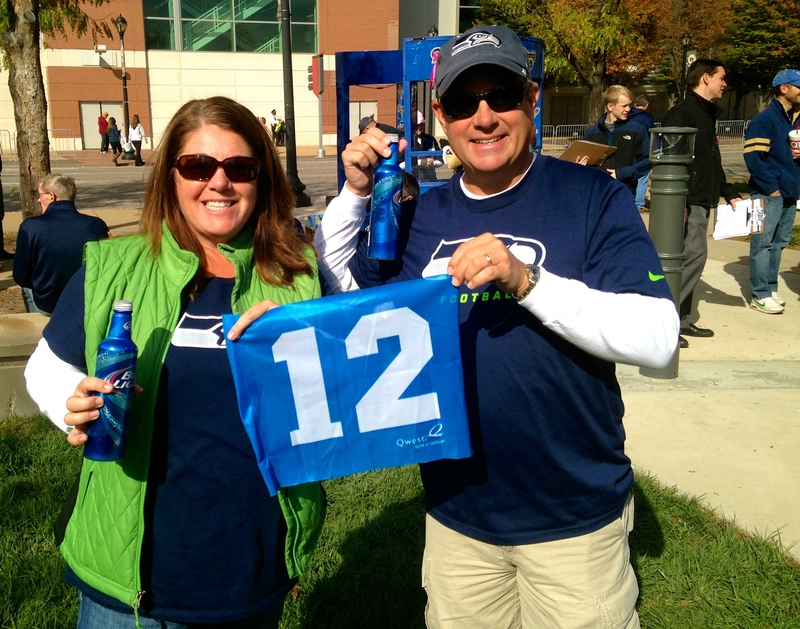 12’s are in the house! We got up early on game day, as the local time for kickoff was scheduled at 12:00 noon. We parked on the east side of the river at the same place we had stayed in our previous visit, knowing we could easily catch the train over to the stadium area. On the train, we talked to some guy who could not have been more negative about the Rams and the dome they played in. He was a real downer, but I can understand how fans get when things are not going well for their team. We got off the train and headed towards the stadium, I had read there was a pre-game outdoor venue right across the street from the dome. 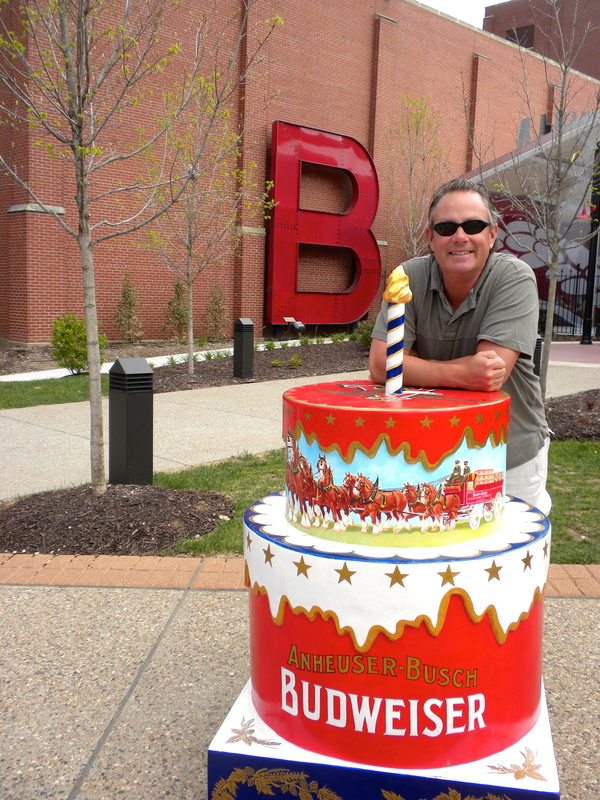 In the park there were several Budweiser trailers, a few food vendors, and a concert stage. The music started at 10:00AM and the festivities were well under way. 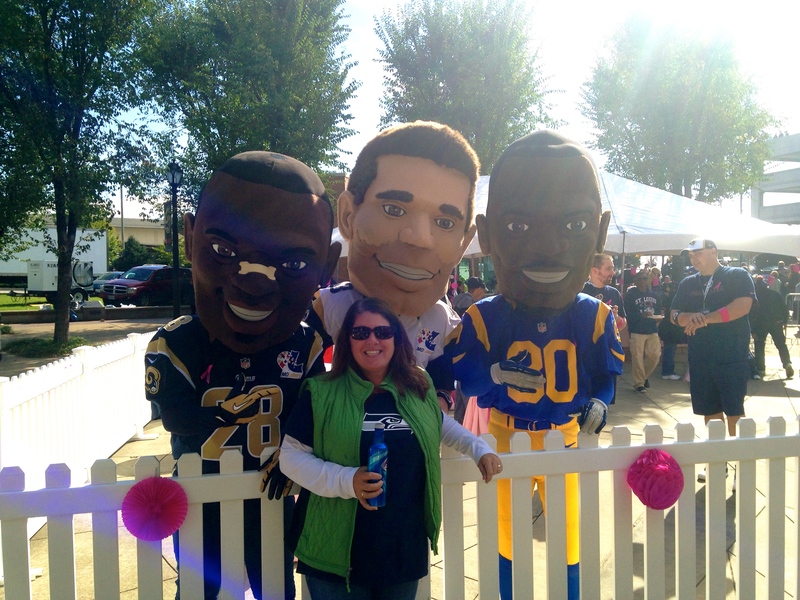 The best thing though was the amazing numbers of Seahawks fans, it seemed like it was 50-50 split of Hawks to Rams fans. We went in to the dome, and it was just as the guy on the train had described, a bit dark and dreary, and the place was empty. We found our seats quickly, and then moved down to about 10 rows off the field, there were so many empty, we had our choice of seats. As the game went on, it did begin to fill in a bit, but I would guess that it was maybe 75% full at the most. Unfortunately the Seahawks special teams did not make the trip, as we got beat by the worst team in our division, any hopes of a return to the Super Bowl look dim at this point. 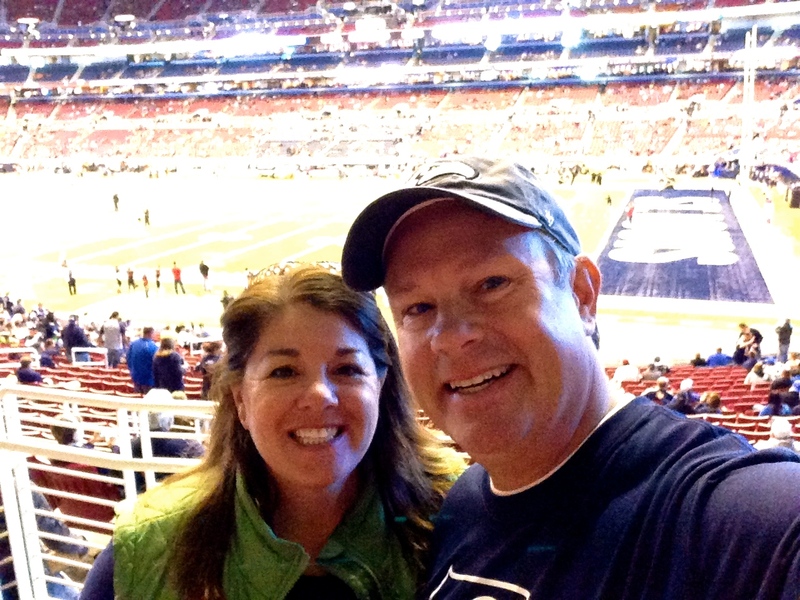 We were glad we were able to make it to a game this year, and hope the team can turn it around. Off to Arkansas, the only state we have yet to visit along our journey! 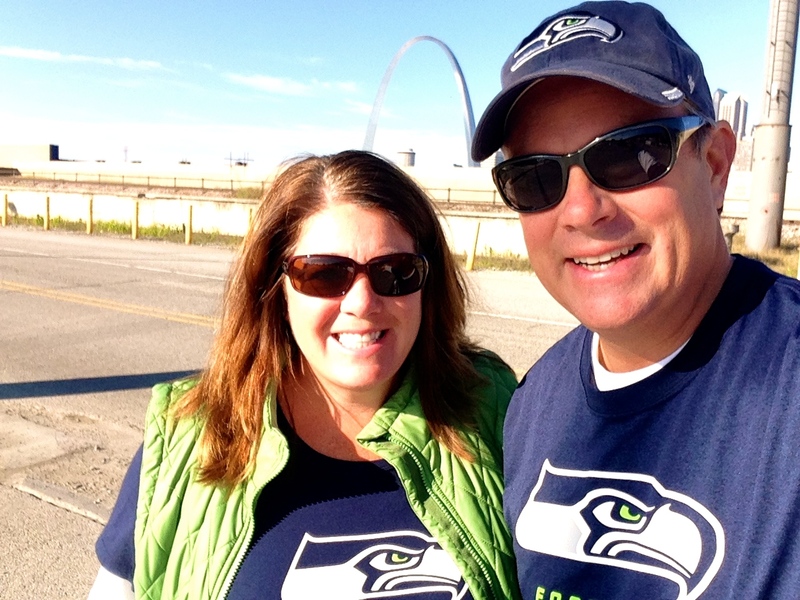 This entry was posted in October 2014 and tagged 12th man, Baldknobbers, Branson, Missouri, Seahwaks, St. Louis on October 23, 2014 by Mike. 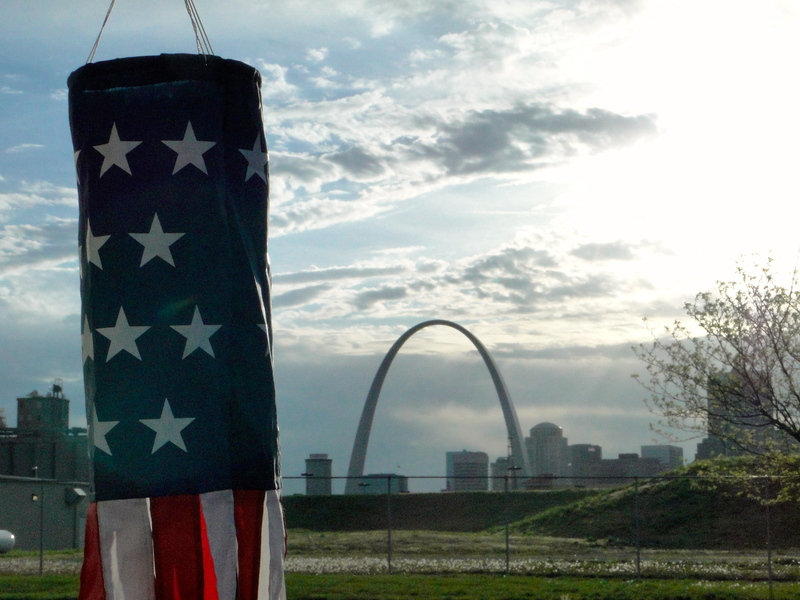 We left Nashville and made the 300-mile (crossing 3 states) trip to St. Louis, a bit longer drive than we like, but that is how things work out sometimes. This wasn’t originally part of our plan, but we decided to make the trek, as we didn’t want to miss the “Gateway to the West.” This was the furthest west we have been since December. 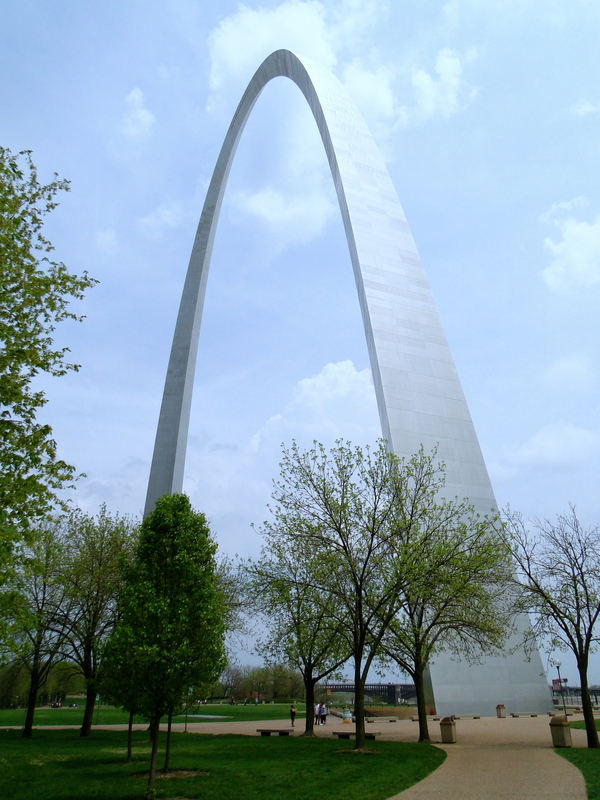 We arrived at the Casino Queen RV Park in East St. Louis, a newer park right on the Mississippi River, across from the city with perfect views of downtown and the iconic Arch. As usual, we were surrounded by train lines and major highways, but the location just couldn’t be beat. After analyzing our next few days stay, we decided to head over to the casino for dinner, as we probably were going to eat out a lot and it did not make a lot of sense to head out and try to find a grocery store. We found a nice little deli/bar and ate a decent meal, played a few slots (the table limits were too high), then returned to the MoHo, a bit tired and looking forward to our adventures in the St. Louis the next couple days. Sunday we got up and headed out to the light rail station across the parking lot from the casino and took it across the river to the city. 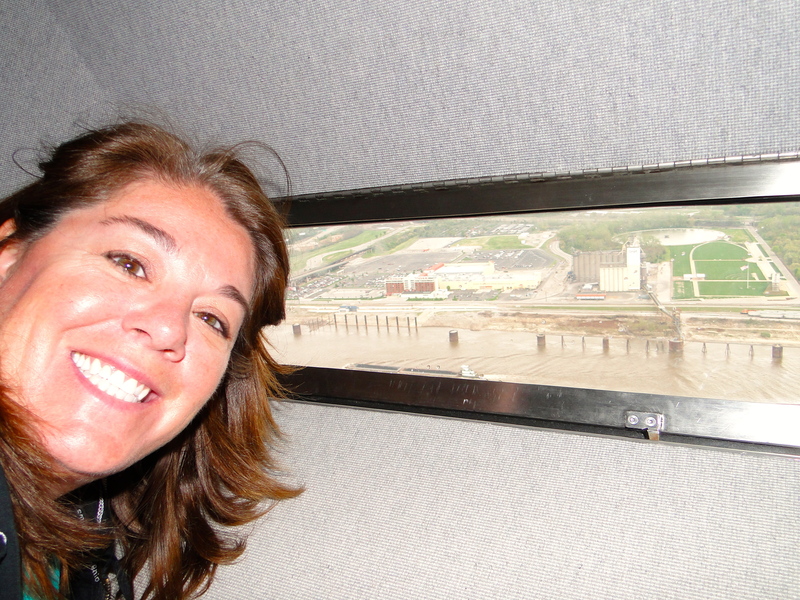 Our fist stop was the Gateway Arch, officially called the Jefferson National Expansion Memorial. We entered into the underground bunker that housed the exhibit, a gift shop, and ticket sales. The tickets were reasonable, only $7 each, with our National Parks pass discount. About an hour later we were in line to head up to the top of the Arch. The capsule to take visitors up to the top was something else. A tiny little bubble that stuffs 5 people in, and it is very close quarters to say the least. (They asked us when we bought our tickets if anyone was prone to motion sickness, which I am, or claustrophobic.) The four minute ride up to the top and a short walk up to the observation windows and we were suddenly 630 feet up in the air looking out small porthole sized windows for 30 miles in both directions. A very amazing view, well worth the trip in itself! I also immediately noticed the movement of the Arch, as it was a windy day, and I could certainly feel it. We descended to the bottom to finish the visit with a few more pictures. On the ground outside, I really started to feel that my equilibrium was not good, and almost felt dizzy for a about the next 3-4 hours; should have taken some of the Dramamine that was sold in the gift shop. We could see the MoHo! Across river, behind red building. This was the hallway at the top. About 100 feet long and 17 ft wide. A pretty closed in space. 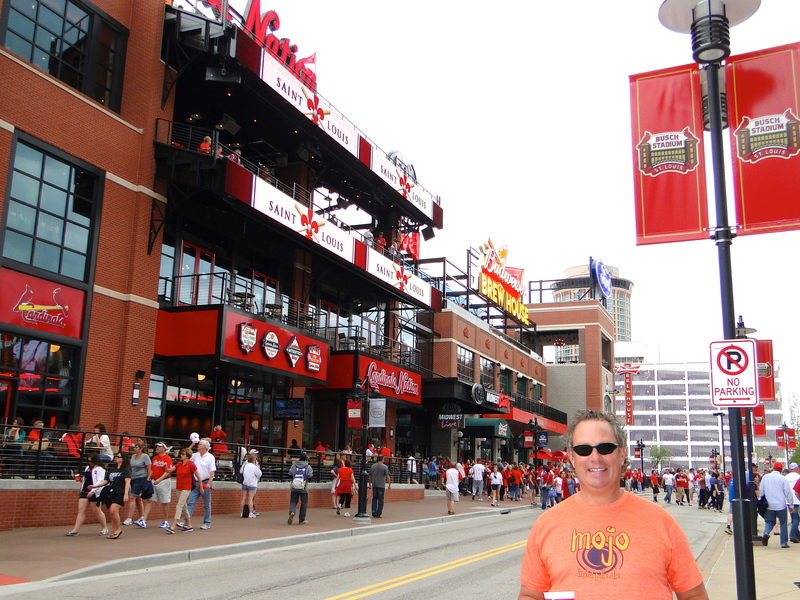 We walked SW out of the park, our next stop was Busch Stadium, and an afternoon Cardinals game vs. the Pirates. We picked up a couple tickets off a guy who had extras and then grabbed a beer in the street and just took in the atmosphere, a much more lively vibe than what you would see outside of a Mariner’s game. The streets were filled with Red Birds fans and there was a really well developed area to get in the mood for a baseball game. We finally entered the stadium, and wandered around and took it all in. The place seemed huge, with 5-6 levels of seats in all sorts of different configurations, with several specialty venues that had different themes and offerings. We also noticed how all the seats were red, and it made it look like the place was packed, yet maybe only ¾ full for most of the game. 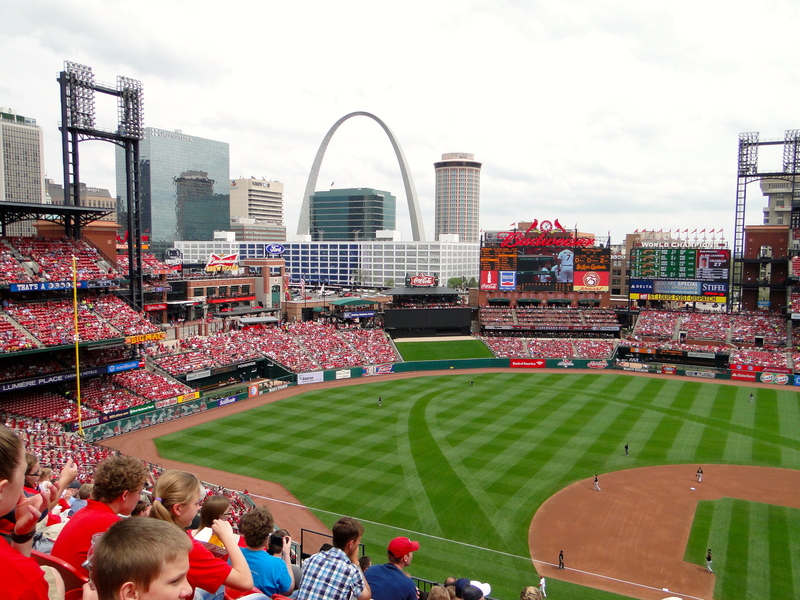 The game was great and the Cardinals won 7-0, a perfect day all around. 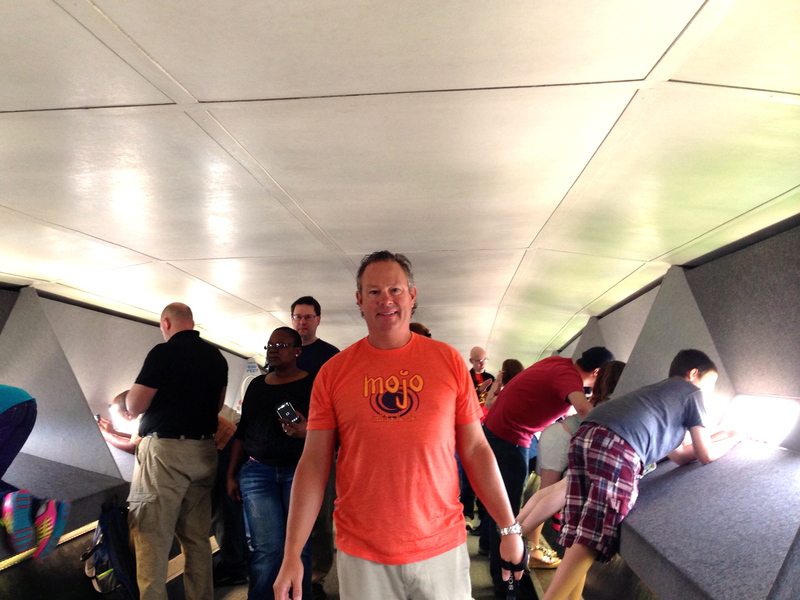 We found our way to the light rail station and returned to the MoHo, and cooked in for the night. The scene before the game. Notice at left, these are bleacher seats OUTSIDE of the stadium (like at Wrigley Field). We texted in our name and got on the big screen! 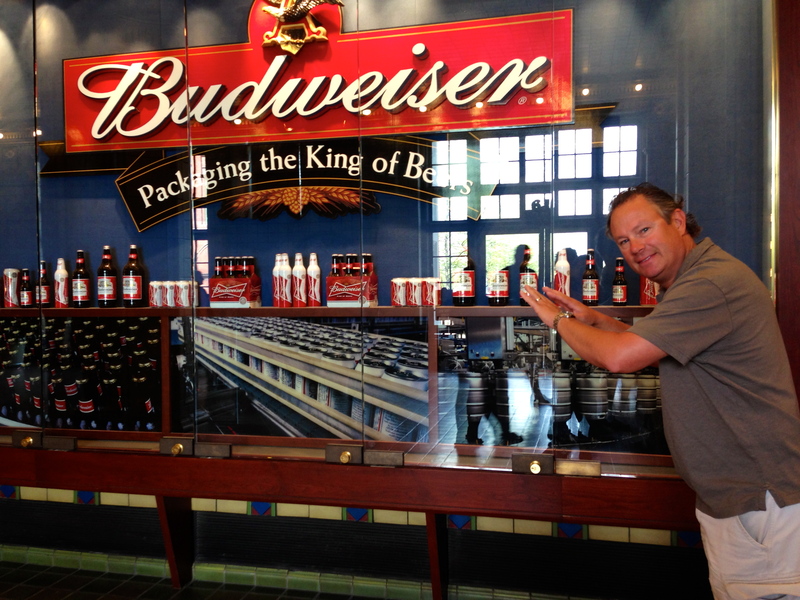 Monday we headed out back across the river, first stop was to Mecca: the Anheuser-Busch Brewery! Many of you that know me, Bud Light is one of my favorite beers, so we had to go to the home of one of the most popular adult beverage makers in the world. The brewery offered a free tour, and it was very well done. 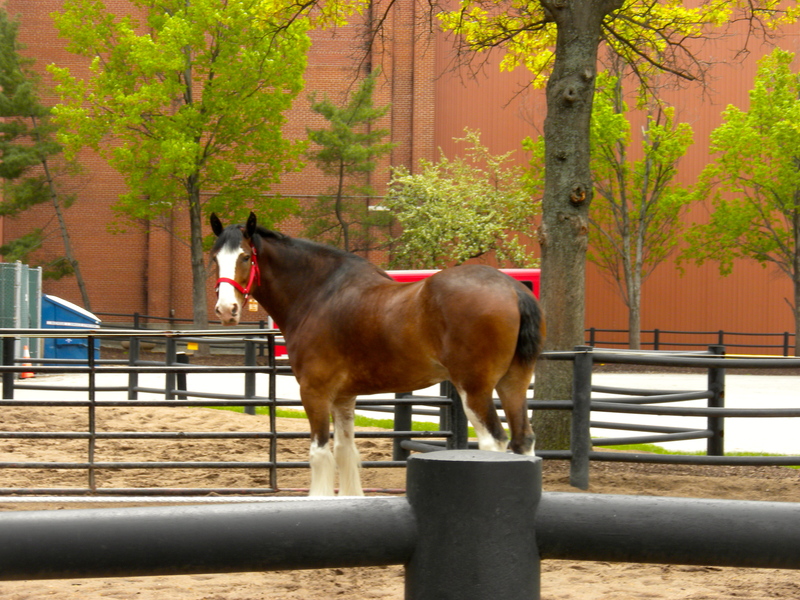 We got to see the Clydesdales in their stables, see how they make the beer, watch some of the production lines and packaging, and finish with a sampling in their outdoor beer garden. The grounds were enormous, and when you get inside to see the operations and learn how much this facility produces, it starts to blow ones mind. They have 360 huge tanks for making beer. Each of these tanks holds about 3,600 gallons of beer. The tour guide said that if you wanted to try and drink enough beer to empty one tank it would require you drinking one beer an hour, for 127 years. The storage facility below one of the packaging buildings holds 10 acres of product, that is a lot of beer! After we finished we headed NW of town to find another of Triple D’s recommended stops, Dressel Public House. I started off with a great shrimp appetizer, with the best cocktail sauce I have ever had. 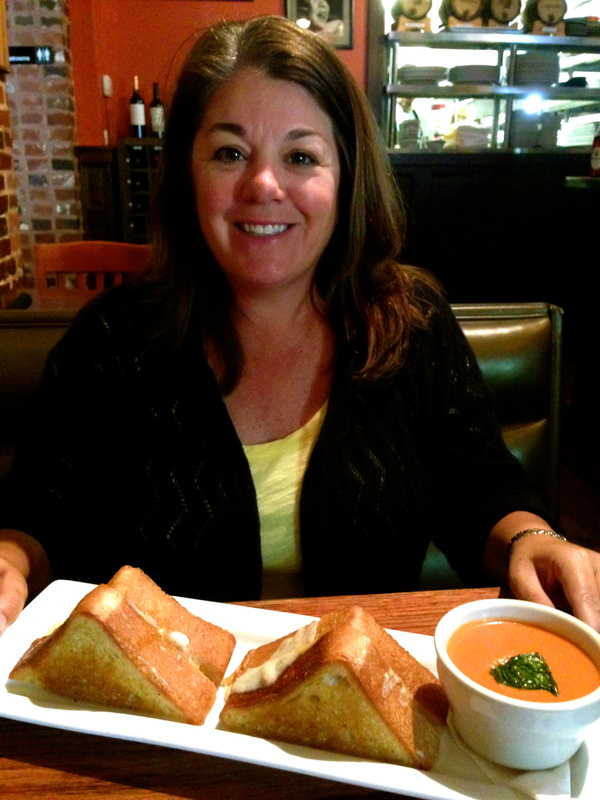 Traci had the Grilled Cheese with truffle oil and a cup of Tomato soup, and I tried the Porchetta sandwich; hers was out of this world, mine just all right. We finished dinner and headed back to the RV Park, hoping the MoHo was still in one piece. During our drive up to the restaurant, I got a call from the RV Park that they were under a Tornado Warning, and if the sirens went off we must immediately make our way to the brick bath houses on property. I had been watching the weather all day, and felt safe where we were, and thought the storms would miss our home on wheels, but it was still a bit unsettling to get a call from the park none the less. We arrived to the Park, and all was fine, and the clouds broke to give us a nice quiet evening before we headed out the next morning. 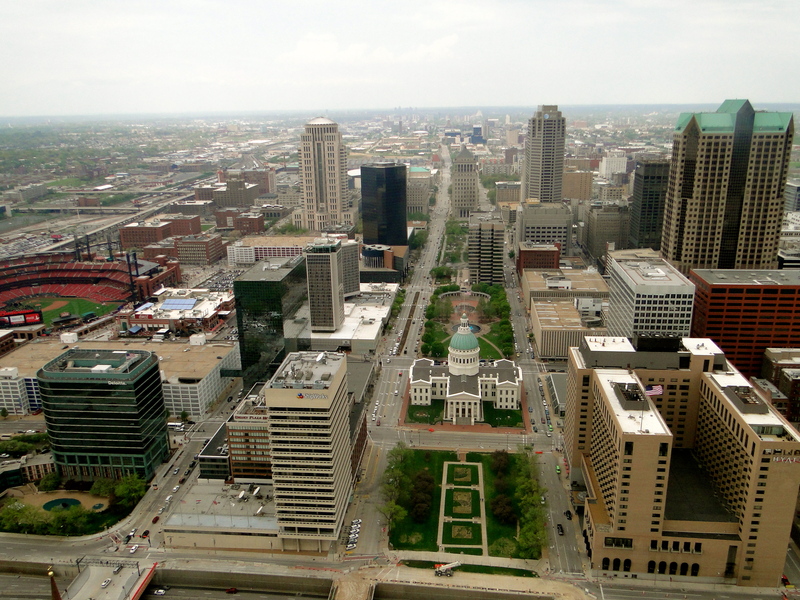 Tuesday we headed east, leaving St. Louis behind for a quick one-night stop in south-central Indiana. We were having dinner at some friend’s home, Emi, Mark, their 2 yr old twins KC and Dillon and family dog, a sweet German Shepherd named Wrigley. They live in the town of Ferdinand, a cute little place of about 2,200 people, small town America at its best. We had a wonderful stop, great home cooked meal and nice visit, so glad we could meet up and enjoy an evening together. The next morning we were off to Louisville and the Kentucky Derby! 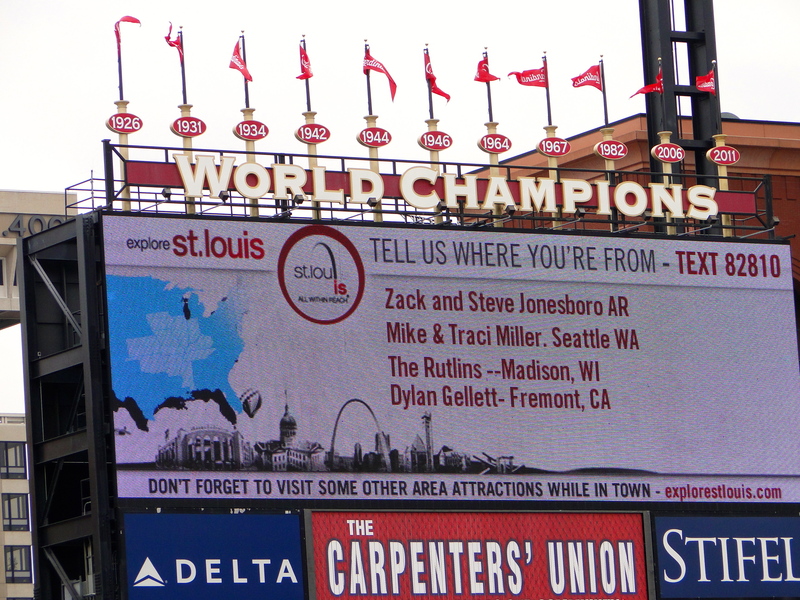 This entry was posted in April 2014 and tagged Anaheuser Busch, Beer, Busch Stadium, Cardinals, Gateway Arch, Grilled Cheese, St. Louis on April 30, 2014 by Mike.